As the post-election dust fails to settle, and details of potential concessions from the Tory and DUP talks emerge, those living elsewhere in The UK have been reading up on the Northern Irish party that may be key in forming our new government. And it makes for some grim reading; anti-women, anti-LGBT, climate change deniers, and creationists. While access to abortion in most cases is free, safe and legal in England, Scotland and Wales, in Northern Ireland, women face up to life imprisonment for accessing abortions unless their life is at risk. While the politics of the last few days have been frustrating and frightening for many of us here in mainland Britain, for those in Northern Ireland, they’ve been living under the archaic human rights restrictions of this party, and other power-sharing leaders in Northern Ireland, for decades. So, now that the rest of the UK have had our eyes opened to what’s happening across the water, the next question is, what can be done to help? There are easy actions you can take today to help further the cause or make things that bit easier for those in Northern Ireland seeking an abortion. The last few days have given us some great articles on what the DUP stands for. These features from Dazed and Confused, Open Democracy and Newsweek have good insights. Our recent blog post by Caitlin de Jode gives great context from a woman who grew up in a DUP constituency. Alliance for Choice are the primary group in Northern Ireland campaigning for abortion rights, their site has articles and information on their work and why abortion rights in Northern Ireland are so important. Siobhan Fenton is a journalist who consistently covers the issue of abortion rights in Northern Ireland, so her work is definitely worth following. And while you're on Twitter, explore hashtags like #freesafelegal, #ldnirish4choice and #trustwomen to discover other voices in the pro-choice community. This explainer from the BBC has clear information on how the law in Northern Ireland differs from the rest of the UK. Friends, family, work colleagues - tell everyone you know about the injustices faced by women, girls and trans men in Northern Ireland seeking abortion. Start conversations, share articles and spread the word on social media. It’s vital that everyone in the UK is made aware of the ongoing situation in Northern Ireland. Getting into bed with the DUP could have implications on abortion rights in the rest of the UK too and this is the time to interrupt that. The most urgent action you can do for those with crisis pregnancies in Northern Ireland right now is donate to the Abortion Support Network - a charity that provides non-judgmental information and funding to women forced to travel and pay privately for a safe abortion. “My family is super Catholic and not supportive of my choice even though my baby has severe defects and will have no kind of life if any. I've never felt so alone in my life". These are quotes from people who’ve been helped by the Abortion Support Network. Last year it received calls from 166 women living in Northern Ireland. Between transport, accommodation, and the procedure itself, it can cost up to £2000 to travel for an abortion - putting it out of reach for many vulnerable women. The work the ASN does is so vital, so any amount you can donate will help women in crisis. Ordinarily, the government in Westminster does not interfere on abortion in Northern Ireland, as powers are devolved to its assembly in Belfast. Nonetheless, MPs in Westminster can put pressure on the Assembly to make changes, especially in light of a recent High Court judgement which noted NI's abortion laws were incompatible with the European Convention on Human Rights. However, the Assembly is not currently sitting due to the failure to form a coalition executive following elections in March. It means the Northern Ireland Secretary James Brokenshire is currently trying to restart power-sharing negotiations with the main parties there. That, coupled with the fact that the Tories are currently talking to the DUP about supporting a government at Westminster, makes this a prime opportunity to lobby your local representatives and insist this issue is at the forefront of discussions. 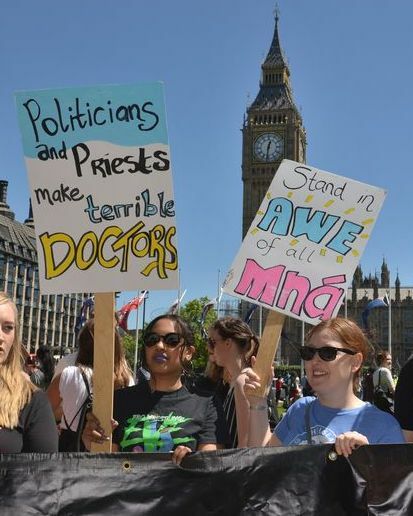 Get in touch with your local MP, Conservative or otherwise, and tell them why abortion rights in Northern Ireland should matter for the rest of the UK too. Human rights violations are happening every day in our country, and it’s happening on their watch. You’ll find the contact details for your local MP here. Join us in the fight for abortion rights. Sign up to the London-Irish Abortion Rights Campaign here, follow us on Facebook, Twitter and Instagram. And come to our next open meeting on June 29th to see how you can get more involved. We hope to see you there! And if you are not in London, there are pro-choice groups all over the UK who need your time.